BEIJING, Nov. 28, 2018 /PRNewswire/ -- Cheetah Mobile Inc. (NYSE: CMCM) ("Cheetah Mobile" or the "Company"), a leading mobile internet company with global market coverage, today announced plans to take legal action against mobile app attribution and analytics company Kochava for providing false information and opinions about Cheetah Mobile's advertising system to the media, leading to a sharp decline in the Company's stock price. The Company believes that Kochava's actions are misleading and completely without merit. 1. In the evidence provided to Cheetah Mobile, click injection occurs whether Cheetah Mobile apps are installed or not. It is unrelated to Cheetah Mobile's apps. "The explanation provided by Cheetah refers to SDKs meant for ad delivery in-app. The fraud detailed in our research and the related article does not look at in-app ad delivery from the apps in question, but instead the syndication of fraudulent signals taking place on the device when the apps are present," he said in an email. In the videos, Kochava first opens a Cheetah Mobile utility app while a large number of apps and SDKs unrelated to Cheetah Mobile's apps are open, such as Appcoach and Webeye. These ad SDKs have no relationship with Cheetah Mobile's utility apps. Kochava then uses the smartphone simulator to install a new app, which causes Appcoach or Webeye to report the installation to Kochava. But since Appcoach and Webeye are not installed inside Cheetah Mobile's apps, this action has nothing to do with Cheetah Mobile. In fact, in the above simulation environment, even if you uninstall all of Cheetah Mobile's apps, an attribution report is generated. But by deliberately opening Cheetah Mobile's utility apps within the simulation environment, Kochava is giving the erroneous impression that the reports generated by the third-party SDKs are related to Cheetah Mobile's apps. Therefore, the evidence presented in Kochava's videos is inaccurate and misleading. 2. Kochava has alleged that all of relevant advertising SDKs embedded in Cheetah Mobile's products are owned and developed by Cheetah Mobile, but in fact, nearly 97% of Cheetah Mobile's overseas utility revenue comes from third-party advertising SDKs. These third-party SDKs can be found on all of the world's major advertising platforms and being used on numerous mainstream global apps. The SDKs are unrelated to Cheetah Mobile. 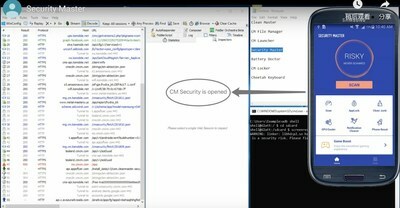 The SDK involved in the suspect activity is actually owned and developed by Cheetah, not by third parties, according to Kochava. 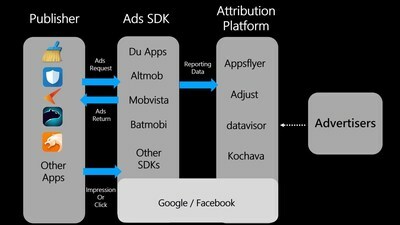 Kochava's videos show that once a new app is installed, advertising SDKs on Cheetah Mobile apps, such as Batmobi, Duapps and Altmob, report the download data to Kochava, which then determines attribution based on this data. Cheetah Mobile cooperates with all of the major global advertising platforms. Every platform provides ads on Cheetah Mobile's apps through their own SDKs embedded on Cheetah Mobile apps. The SDKs and third-party attribution platforms work together to determine attribution of app installations. Cheetah Mobile is not part of this process. Kochava is an app attribution company, whose business model is based on determining installation attribution from third-party SDKs. Therefore, they fully understand that attribution is unrelated to the app itself. In their videos, they are misleading the media to believe that Cheetah Mobile is engaged in fraudulent practices. 3. The media and Kochava intentionally exaggerated the relationship between Cheetah Mobile and Kika Tech to intentionally overstate Cheetah Mobile's influence over Kika Tech. The other app is owned by Kika Tech, a Chinese company now headquartered in Silicon Valley that received a significant investment from Cheetah in 2016. This statement is misleading. Kika Tech is just one of more than 80 companies that the Company has invested in. Cheetah Mobile owns less than a five percent stake in Kika Tech and has no seats on the board. Furthermore, the Company has zero operational control over Kika Tech. 4. Kochava has severely damaged the reputation of a public company with its unfounded claims. The Company reserves the right to take legal action against Kochava. "This is theft — no other way to say it." The Company finds this comment extremely hostile and outrageous. Cheetah Mobile is a leading global app developer with numerous global partnerships. In the third quarter 2018, 70.31% of the Company's overseas utility revenue came from Google and Facebook's ad SDKs, while 26.06% came from other mainstream global ad platform SDKs. These SDKs are used on mainstream apps throughout the world. Cheetah Mobile's success is based on long-term steady development and providing users with a better user experience. The Company is dedicated to building a healthy development model. The Company is also committed to complying with all relevant Google policies, GDPR, laws and regulations. Gaia Guan, CEO of Moca Technology, a global mobile advertising platform focused on India and developing markets, said, "Cheetah Mobile is a pioneering Chinese mobile app company overseas. They are constantly focused on improving the product experience and ad experience for users, while strictly adhering to industry regulations and standards. In our many years working with Cheetah Mobile, they have always put the user and advertisers first, while treating their partnerships fairly and transparently." Cheetah Mobile has cooperated with the third-party security firm Threat Hunter to investigate the situation, particularly regarding the advertising SDKs featured in the videos that could potentially possess attribution risks, namely Batmobi and Duapps. To be cautious, the Company has proactively removed them in our updated apps. We continue to investigate, and will suspend cooperation with any SDK providers that are found to be engaging in fraudulent activities. Kochava has a relatively small market share. In 2016, Kochava publicized its cooperation with Cheetah Mobile multiple times to raise its prestige, while seeking to expand its cooperation with the Company. Cheetah Mobile ceased its collaboration with Kochava in September 2016. Cheetah Mobile rejects Kochava's accusations as baseless. The Company will continue to place even more value on advertisers' rights and making sure the industry develops in a healthy way. As one of the top publishers in the world, Cheetah Mobile pledges to redouble its efforts towards monitoring and detecting potential issues within third-party ad SDKs and its own products in order to ensure maximum benefits for advertisers and users alike.